Total happiness can be found at the end of a short block on Ashby Avenue in Berkeley, California inside the green door of Casa de Chocolates. Visiting Tail of the Yak brings endless inspiration while visiting Casa de Chocolates ensures sensory satisfaction. 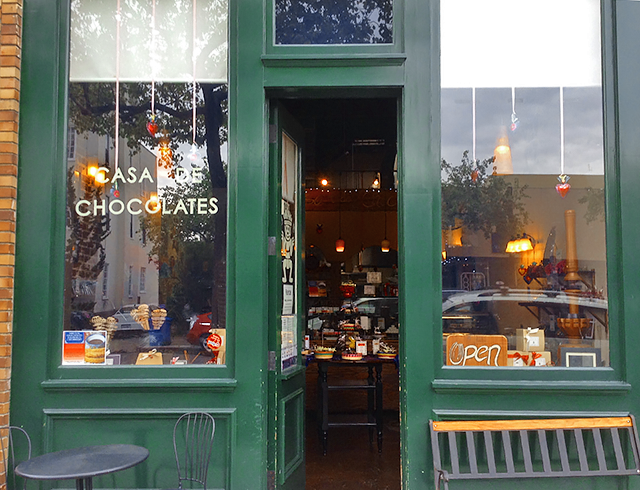 Directly across the street from the Yak is a tiny store housing delicious hand-made chocolate. They have a case full of bonbons so beautiful they look like decorative art. 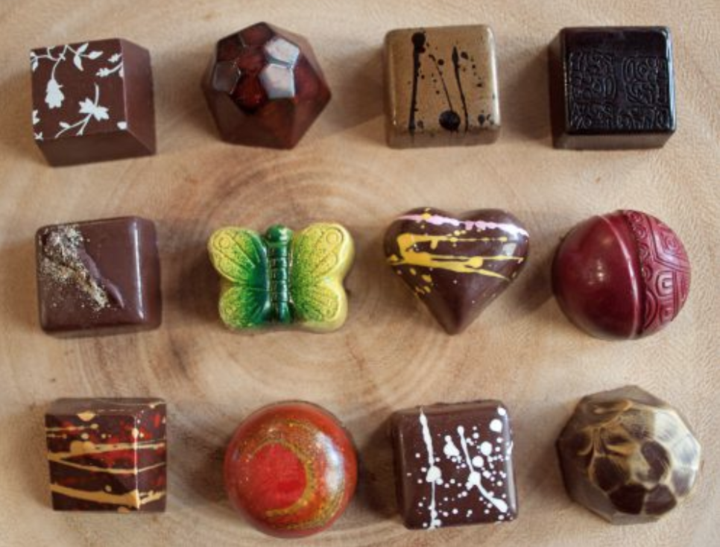 Cajeta, chipotle, tequila, mole, mezcal and guayaba are just a few of the bonbon flavors. 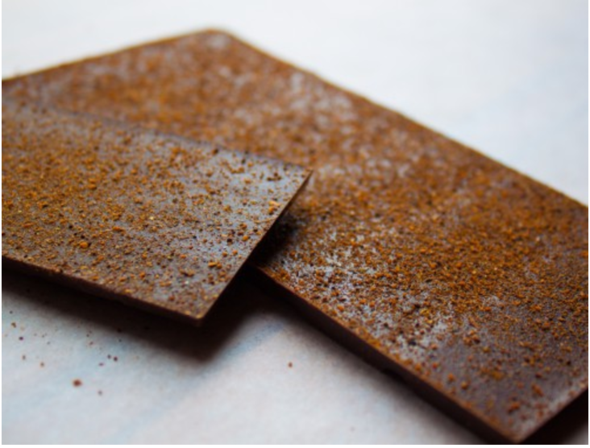 Who can resist these simple but lovely packaged bars? Certainly not me. Shelves are full of chocolate bars. In addition to regular sized bars, they also offer a mini-size. This smaller size is perfect for allowing one to try many of the unusual flavors. I was happy to oblige. 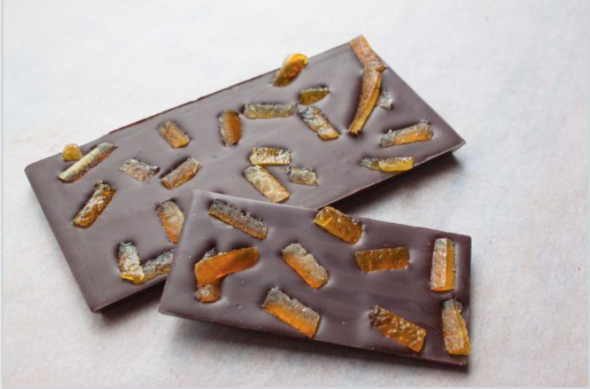 The Valencia orange has strips of candied orange looking a bit like stained glass windows. Delicious. 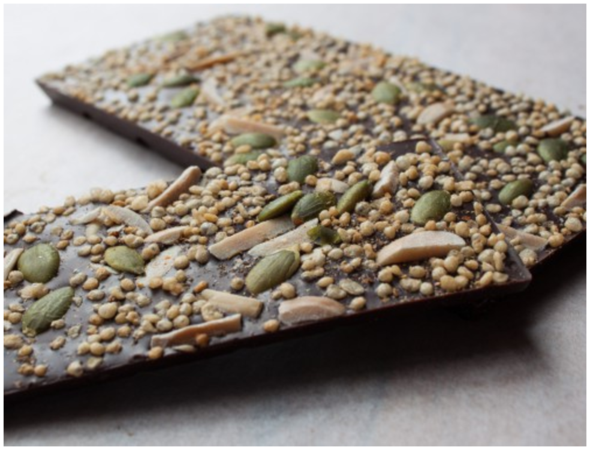 The Fuerte was another favorite with its interesting mix of pumpkin seeds, quinoa, chile, almonds and sea salt. Crunchy and unusual. 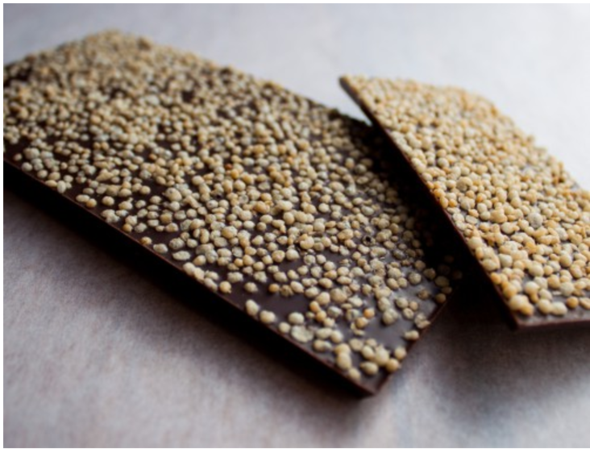 The Inca Crunch is topped with toasted quinoa. The Mole has 11 different spices and chiles topping the chocolate. 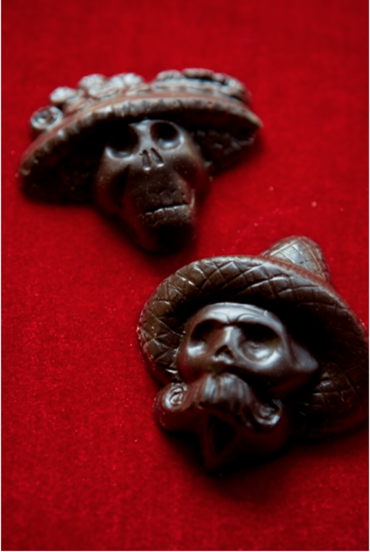 The Calaveras are for making delicious Mexican hot chocolate. Add one to a cup of boiling water or milk. Hot or iced hot chocolate, as well as a selection of desserts, can be ordered for take out. Unfortunately, we had just eaten so we did not indulge. Next time we are in Berkeley we won’t miss this treat. 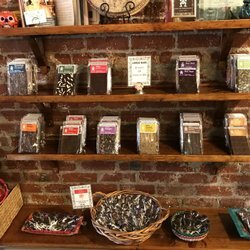 For those of us not lucky enough to live nearby, Casa de Chocolate sells online. These just may be my client Christmas gifts this year. Lucky them. Casa V Interiors can add some Mexican flavor to your home to spice it up.